There has always been a great deal of controversy over the subject of renting vs buying property. And while I used to be deep in the “own property all the time” camp, I shifted my own position on this a few years ago. When I looked at the true cost of owning property, including maintenance, repairs, taxes and insurance, it’s clear that owning property is a lot more expensive than people imagine. As such it’s not the slam dunk wealth builder solution I thought it was. This is not to say that owning property is a bad idea. I think it’s a great option – for the right person under the right circumstances. The long and short of it is that owning real estate is a better move if you are trying to accumulate wealth. And renting property is probably a better financial move when you are most concerned about cash flow. That’s because the forced savings element of making mortgage payments and the potential price appreciation are more important to people trying to grow their wealth than to those who are mainly interested in maximizing their monthly positive cash flow. If your goal is to seriously grow your net worth, you’ve got to make maximum use of your major assets which are time and money. The more money you set aside and the sooner you do so, the richer you will become. Let’s first talk about the amount of money to set aside. You may be a renter because you like it that way or because you don’t have the scratch for a down payment. It doesn’t matter. You still have a cash flow advantage over property owners in that you don’t have the expenses that they do and your rent is probably lower than the mortgage you’d be paying. You can take advantage of that benefit by figuring out how much you are saving by not owning property and forcing yourself to save those stacks. 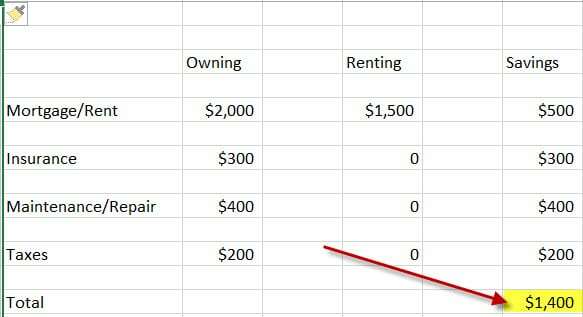 Here’s a hypothetical example of one person who saves about $1400 a month by not owning property. That’s serious money. Over 15 years, that could grow to over $407,000 if the person invested this money and earned 6% on average. Of course your savings and returns will be different. But you can see how quickly you can grow your wealth if you are a renter. Cool….right? When I say force yourself, I really mean it. If you kick back and let things happen on their own, they won’t. And if you play it that way you’ll be in the exact same financial state five years from now as you are today. We’re looking for progress Pilgrim so let’s hop to it. My suggestion is to set up automatic transfers from your bank account each month into your investment account. This way you don’t have to think about it and your success is automatic. Righteous. I further recommend that these transfers occur at the start of the month rather than at the end of the month. This way you declare to the world that your savings are your priority. It’s true that when you carve out your savings as soon as you get paid you force yourself to make do with the money left over for the rest of the month. That might mean you’ll have to tighten your belt once in a while. So what? That’s a far better way to achieve your goal than to only save what’s left over. People who do that generally don’t have money left over and they usually stay stuck. Bad tone. You maximize the value of your time by getting started on this program ASAP – like today. It should take you less than 30 minutes to figure out how much you should save and then another 30 minutes to set up the automatic investment program. If you don’t think it’s reasonable to put aside all the money you save by renting, don’t sweat it. Can you start with half that amount? How about 25%? What about 10%? It doesn’t matter how much you start with as long as you start and start today. Over time, you’ll see how cool it is. Trust me. People who do this fall in love with it and magically find ways to bump their savings number up almost overnight. I’ve seen countless examples of this. You are probably the next one. Prove me right friend. Your next step is to invest your savings appropriately. If you are saving to buy a house your investment strategy will be different than if you are building your retirement nest egg. Your investing time-frame is most important in helping you figure out how to invest that money. Generally speaking, the longer that time frame, the smarter it may be to invest using equity growth. Of course, each person’s situation is different so take a little time to study up on how investments work and make sure you find the mix that suits your needs best. Your last step is to audit yourself. Are you saving all you could? Are you investing correctly? The best way to evaluate these things is to consult with someone else. Talk to a trusted friend who knows a thing or two about investing or even hire an advisor for an hour or two to discuss it. It doesn’t matter who you speak with as long as you find an objective credible person to take a look at what you are doing and to provide their own observations. Again, you want to make sure you are investing correctly and that you are saving all you can – at least for now. That means you’ll probably want to share your budget with this other person to justify your savings number. Just because you are a renter doesn’t mean you can’t have financial freedom. Figure out what you save by not owning property and start saving that cash starting now. Over time, you’ll that savings grow far greater than you probably ever imagined. Are you saving more because you rent? Have you automated that savings? Are you saving as much as possible? How do you know?